Happy Tuesday! It's still hot here in San Diego and the last thing I want to do right about now is toss on a sweater! I was so inspired by these black and white floral bottoms because they don't limit the outfit color-wise, so I paired it up with this red-orange peplum and accessories accordingly. the About Pretty Things Etsy Shop!! *indicate the extra entries on your comment. Giveaway ends Friday, September 7, 2012. Love love the pants they are so cute! & paired very nicely with the color top! I love this outfit! Peplum and floral jeans are two of my favorite trends right now and I love them paired together! Cool color combo too! Following with GFC, liked both pages on FB, and following on Twitter (@thetinyheart). Additonal entries: Following your Instagram and About Pretty Things on Instagram (@thetinyheart). the others I already have followed. It's good to get that extra help when putting things all together.Really cute ! Love those bracelet! You look amazing. Love your DD's floral skinny!!!! Pau we are looving the outfit!! That pop of color on the peplum top is to die for...great job love! There's something about that clutch that makes me jealous! You look adorable. I love the red paired with the patterned pants, so simple and elegant! Gorgeous! I love those pants! hyped your outfit! looks amazing! WOW! 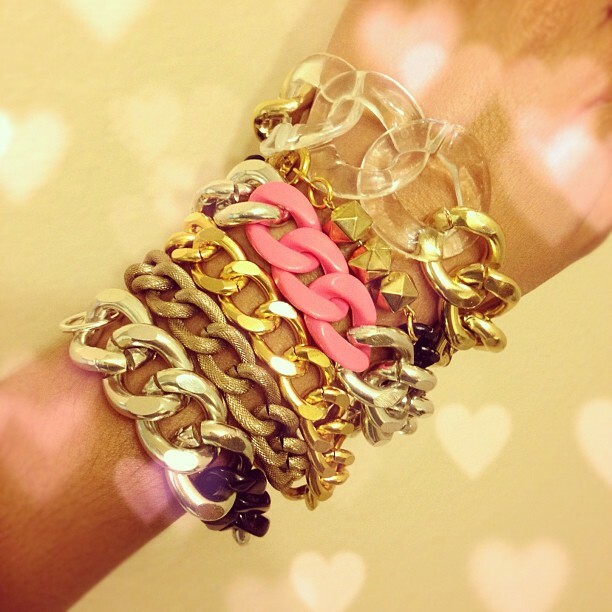 I love these bracelets! Such an elegant outfit !! Love how you mixed the peplum orange top and the pants !!! I love this look black and white is just so classic and you added the perfect color to liven it up. I would like to enter the giveaway I follow you on GFC and on Instagram as well as FB. I liked About pretty things on FB and followed on Twitter as well. I saw this look of yours on IG and immediately loved it. Looking fabulous love the peplup top and printed jeans is perfection on you. Great giveaway and of course enter me. Followed all the rules and you already know i follow you on IG too. Sorry no twitter for me! Super cute outfit, I am loving the peplum trend. I liked Lil Bits of Chic on facebook. I liked About Pretty Things on facebook. I already follow About Pretty Things on twitter. I followed About Pretty Things on instagram! you look very elegant! i adore this. You sure can rock those printed pants well!! Hey girl! Don't know if you remember me...but I certainly remember you :) My blog was deleted and I had to start a new one...so now I'm following you again! It's been a few months but I'm glad to be following you again! Love this outfit, by the way. I really like those floral pants with that bright peplum top! what a cute and bright peplum top..
Oh SNAP I love those chunky chain bracelets! I was already following you on Twitter, but I added Google whatever, Instagram, and FB. And About Pretty Things on FB, Twitter and Instagram. Thanks, girl! Such a nice outfit you have here!